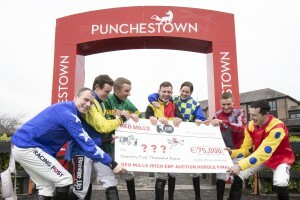 Irish European Breeders’ Fund and Connolly’s RED MILLS today announced that the €75,000 Auction Hurdle Series Final will take place on Gold Cup Day at the Punchestown Festival (Wednesday 1st May). To enter the €75,000 final, horses must have run in one of the fourteen qualifiers and have not won a listed race or a Grade 1, 2 or 3 race. To date nine of the fourteen qualifying races have been run with the next race taking place on Thursday 24th January at Gowran Park on the prestigious Goffs Thyestes Day. The last four chances to qualify to enter the final take place on 9th February (Naas), 23rd February (Fairyhouse), 4th March (Leopardstown) and 24th March (Downpatrick). This is the first year of the series, which commenced at the Listowel Harvest Festival. The series was designed to create opportunities for horses bought for €45,000/€30,000 or less at store sales in Ireland and the UK, thereby, giving owners and trainers an opportunity to claim some of the €355,000 prize-money on offer. The conditions for the qualifying races specify that all horses must be by an EBF registered stallion and bought as an unraced three or four-year-old at a recognised National Hunt Store sale for €45,000/ €30,000 or less, with weight allowances depending on purchase price. In addition, the €5,000 Weatherbys/ITBA NH Fillies Bonus Scheme is in place for all races in the series.